Reduced from $150.00. Natural Untreated Oval Kyanite with .14ctw of diamond accents in a bypass halo design and set in 10K Rose Gold. Center Kyanite stone is a very pretty shade of blue. Looks like a blue sapphire. 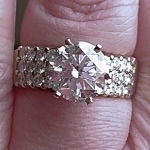 I would estimate that the small diamond accent stones are around I1-I3 clarity. Please see the videos below. Free USPS Shipping within USA is included. As I am a Private Seller, This is a Final Sale.